The Best Western Hotel Piccadilly is a comfortable, affordable hotel centrally located near the Coliseum, Roman Forum and other iconic landmarks. The hotel offers easy access to public transportation, making it a convenient base from which to explore the city. 55 guest rooms are decorated wit modern flair, and offer free Wi-Fi, flat-screen TVs and minibars. A breakfast buffet is available each morning. 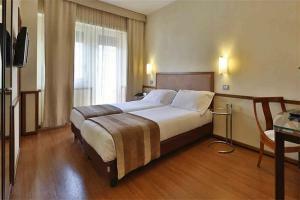 Located approximately 8 miles from Ciampino Airport. Roma Termini is just under two miles away. San Giovanni and Rei di Roma Metro stations are both less than half a mile away.